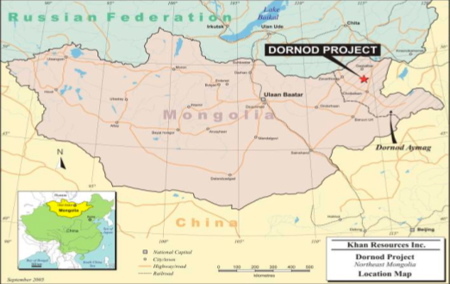 Khan Resources Inc. (“Khan” or the “Company”) (CSE:KRI) announced on March 2, 2015 that an international arbitration tribunal had rendered an award to Khan as compensation for the Government of Mongolia’s actions in relation to the cancellation of Khan’s uranium licenses in 2009. The award is now due from the Government of Mongolia and Monatom LLC. The award consisted of a Base Amount of US$80 million plus interest at LIBOR +2% (compounded annually) from July 1, 2009 to the time of payment. In addition, the Tribunal awarded costs of US$9.1 million in favour of Khan. As of March 31, 2015, the award aggregates to US$103.8 million. Interest is currently accruing at a rate of 2.546% or US$6,485 per day. The Company has tabled the above amount with the Government of Mongolia and has asked for full and prompt payment.